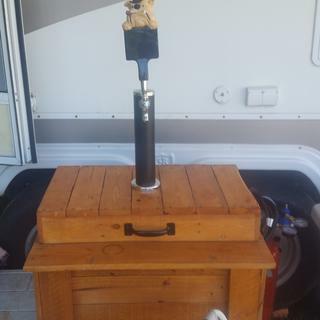 Combine an old cooler, a little bit of work, and this jockey box coil, and in no time flat you'll have a mobile draft beer dispenser for picnics and parties everywhere! If you already know about the draft-dispensing wonders of a jockey box, you know that this stainless steel jockey box coil is integral to delivering you perfectly chilled beer with every pour. Jockey box coils are designed to cool your beer as it travels through the coil. They sit inside a cooler, in an ice bath. These 304 stainless steel coils will not corrode over time with regular cleaning. 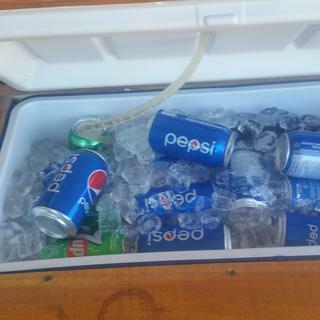 Just keep it submerged in an ice bath inside the jockey box and you’ll be enjoying frosty beer all day. Use the included grommet, ferrule, and hex nut to attach the coil to a shank and faucet for easy, pump-free dispensing. In 5/16" outside diameter, these coils are the right size for the majority of jockey box kits. 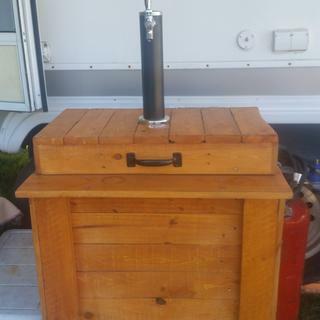 Set up your jockey box no more than 10 feet from your ice cold keg. 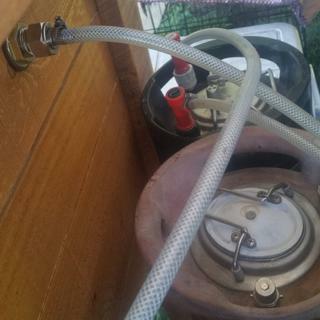 Attach the beer line from the top of the keg coupler to the cooler coupling, and the air line from the outlet barb on the CO2 regulator to other side of the coupler. Adjust the keg regulator to 40-60 PSI based on your setup. Keep both the jockey box coils and keg cold throughout to avoid foaming (no more than 40° F). Please note: this product listing includes the 50' coil and fittings only. Check out our entire line of jockey boxes for full kits, build-your-own kits, and more! Would this work as a "permanent" solution if placed in a small freezer? How many degrees will this drop the beer temp? I need to replace my current chest freezer that holds my kegs, because it runs to hot for it's location. I'm considering replacing it with a small freezer that just holds something like this coil. BEST ANSWER: Hey Mike! Thanks for checking out Kegworks! We can say for certain how much colder your beer would get from the kind of setup you're talking about. You'd also still need to ensure the Keg is kept cold, even with this set up. Please give a call to our customer care team at 877-636-3673 to discuss which options would get you to the perfect pour. Cheers! What is the ID of the tube? BEST ANSWER: The ID is 3/16"
Looking for 1/2" OD tubing coil. 10-12" diameter. Do you have anything like that? BEST ANSWER: We don't have a coil that matches those specs. If you contact our customer care department to tell us more about your project, we'll do our best to help you find what you need. Cheers! What is the diameter and height of the coil? BEST ANSWER: Roughly 12 inches high by 10 inches wide.